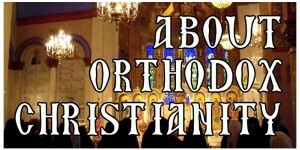 EXPLORING ORTHODOX CHRISTIANITY is a six-week experience for anyone interested in understanding better the faith, teachings, history, worship and practices of the Orthodox Christian Church. This Lent Unit (Saturdays Mar. 16 – Apr. 20) is complemented by an Advent Unit held in the Fall. This evening program begins with 5pm Vespers on Saturday night, followed by a common potluck fasting meal (roughly 6pm, no meat or dairy, please), a short presentation and discussion. One or more church members will give the presentation(s) and moderate the discussion. Each evening’s program should wrap up by 7-7:30pm. This program is recommended for all interested (including Orthodox Christians, non-Christians or non-Orthodox Christians) and is also part of the standard preparation for formally enrolled catechumens of the parish (those who have made a commitment to become Orthodox Christians). On Sunday, February 17, at 10:30am, Orthodox Christian iconographer Protodeacon Paul Drozdowski will be discussing the creation of the “Axion Estin of Emmaus” icon and will briefly touch on relevant issues which iconographers in previous centuries never encountered. The talk will be preceded by the Orthodox Divine Liturgy, served at 9am. A lifelong artist, Pdn. Paul formally studied drawing, painting, printmaking, and design at Tyler School of Art, Temple University, earning a Bachelor’s degree of Fine Arts. Subsequently, he spent a year and a half studying at Holy Trinity Theological Seminary in Jordanville, NY. During that time, he simultaneously worked under the tutelage of master iconographer Fr. Andrei Erastov, and began fulfilling monastery orders almost immediately. Thus he was able to synthesize his artistic studies. Since then, Pdn. Paul has fulfilled many commissions for both churches and individuals, and his work can be seen coast to coast. He is also the illustrator of the children’s book St. Seraphim’s Beatitudes, authored by Fr. Daniel Marshall. Pdn. Paul enjoys classical music, world and local history, and nature walks with his family. Fr. Paul is currently an ordained clergyman, in the rank of protodeacon, and serves at the Russian Orthodox Cathedral of St. Alexander Nevsky in Howell, NJ. This icon, enshrined at St. Paul Antiochian Orthodox Church of Emmaus, Pennsylvania, is modeled on the original Axion Estin (“It Is Truly Meet”) icon of Mount Athos (feast day, June 11). It was in AD 982 before the Athonite icon that the expanded version of the hymn “More honorable than the cherubim…” was first sung by the Archangel Gabriel, who added the prelude “It is truly meet to call thee blessed, O Theotokos, ever-blessed and all-blameless and the Mother of our God,” and inscribed the hymn miraculously with his finger on a slate tile. The hymn has been sung ever since in the Divine Liturgy of the Orthodox Church. The original Axion Estin icon is kept in the apse of the Protaton Church in Karyes on Mount Athos. The Axion Estin of Emmaus was painted by iconographer Protodeacon Paul Drozdowski in 2018. It features the main inscription in four languages: Greek (next to the head of the Virgin), Church Slavonic and Arabic (at top), and English (at bottom). The six saints who surround the Theotokos and the Lord Jesus are the Holy Hierarchs of America: (top) Tikhon of Moscow and Raphael of Brooklyn, (middle) Innocent of Moscow and Mardarije of Libertyville, (bottom) John of San Francisco and Nikolaj of Žiča. All served in America, and several of them spent time in Pennsylvania. 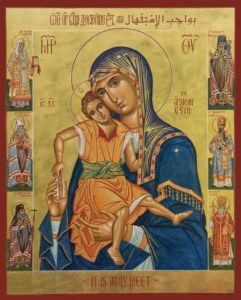 Although the Festal Divine Liturgy is what most of us think of as the “primary” service for this feast, it is the other services that really contain the wealth of our Holy Church’s teaching about the Nativity of our Lord and its significance. If you have never attended these other services, please take the opportunity to do so this year. They are among the most beautiful services of the festal cycle. If you would like to read more about this great feast, click here. Theophany is the feast of the Baptism of Jesus Christ, when He began His public ministry by being baptized by St. John the Forerunner (John the Baptist) in the Jordan River. This act not only introduced Him to the world, but also made Christian baptism possible (by His blessing of the waters) and made plain the three Persons of the Holy Trinity—the Father speaking from the heavens, the Son being baptized and the Holy Spirit descending on the Son in the form of a dove. Theophany means “the appearance of God” and refers to this revelation of the Holy Trinity. As part of the celebrations of this great feast—which is second in rank only to Pascha (Easter) and thus more important than Christmas!—holy water is blessed for use throughout the year, especially for the blessing of all parishioners’ homes. Please note that the eve of Holy Theophany (January 5) is appointed to be kept as a strict fast day—no meat, poultry, fish with backbones, dairy, wine or oil are to be consumed. To read more about Holy Theophany, click here. EXPLORING ORTHODOX CHRISTIANITY is a seven-week experience for anyone interested in understanding better the faith, teachings, history, worship and practices of the Orthodox Christian Church. This Advent Unit (Saturdays Nov. 10 – Dec. 22) is complemented by a Lent Unit held in the Spring. This evening program begins with 5pm Vespers on Saturday night, followed by a common potluck fasting meal (roughly 6pm, no meat or dairy, please) and a short presentation and discussion. One or more church members will give the presentation(s) and moderate the discussion. Each evening’s program should wrap up by 7-7:30pm. Question & answer session with His Grace, Bishop Thomas. Come prepared with questions!